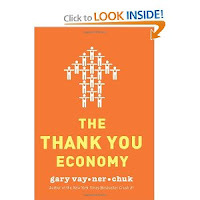 The “Thank You” Economy--Missing Link to the Social Media Story? “If this were 1923, this book would have been called "Why Radio Is Going to Change the Game" . . . The author does a great job explaining how the rise of the communications we call “social media” will combine with behaviors of successful customer-centric companies to turn the marketing calculus on its head. Find out how companies big and small can scale personal, one-on-one attention to their entire customer base, no matter how huge, by using the same social media platforms that carry consumer word of mouth. The Thank You Economy offers compelling, data-driven evidence that we have entered an entirely new business era, one in which the companies that see the biggest returns won't be those that can throw the most money at an advertising campaign but the ones that can make their customers feel that they care the most about them. The businesses and brands that harness the word-of-mouth power from social media to shift their cultures to be more customer-aware and fan-friendly, believes Vanderchuck, will be successful in getting and keeping customers over the long term.